Moving into the second week of the synod, Cardinal Vincent has reflected on the progress of the first week and the work of his small group. 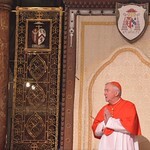 In total the Cardinal estimated that they had heard 190 individual contributions in the first week. This was followed by two days of small group discussions. He explained that in his small group, they had been bound together by speaking of their own experiences of being family members. The Cardinal explained that the group wanted to emphasise that when we look at the reality of family life, we must look at it with the eyes of faith, ‘trying to see where God is at work in the courageous, wonderful lives of so many different families.’ Above all, the group wanted to thank those Christian people who live faithfully the life of their family. Cardinal Vincent explained that the synod was moving forward. There will be difficult issues ahead, such as how we balance being absolutely faithful to what Jesus taught about the permanence and the commitment of marriage and what he taught about his mercy and his appeal to all those who are burdened to come to him. He felt that on Saturday during the speeches, the way forward for the synod slowly began to become clear, but there are still two weeks to go, and very much work to be done still.